Wendell set his saucer and cup in the sink and looked out the window. His neighbor's teenage son pushed an orange Yazoo mower out of a work shed. The old man checked the radio-clock. Seven AM, and this was just the beginning of the boy's day. Later he'd trim the hedge or clean the gutters or paint the garage. Allen Cranston never seemed to be free for anything else. Wendell lowered his gaze to his own yard. He mowed occasionally, but there were so many hard-to-reach places where grass grew tall. Nothing at all grew under the maples, where leaves formed a gray carpet. He spotted a brown lump near the birdbath. A gopher mound? Just what he needed. The Yazoo roared to life. Wendell headed for the bedroom. "Might as well get on my shoes and go out," he said to Gladys' side of the bed. Patti bounced along at Wendell's feet. The old man held out his hand; the cocker spaniel jumped up and smacked her head against his palm. Wendell paused halfway across the yard. This was where he'd seen the brown lump, but there was nothing here now. He scratched his balding scalp. The peach and white dog trotted in circles, nose to the ground, and growled. "Yo, Henderson!" Cranston Senior stood at the fence. The old man winced. "Up kinda early, aintcha?" "Oh, got things to do, things to do," said Wendell. "Finally getting around to the hedge?" The hedge marked the western border of both properties. The Cranston end was smooth as brick; the Henderson section resembled a row of Christmas trees. "I like the hedge tall," said Wendell. "It gives me shade in the evening." "Your yard could be a showpiece, if you'd just do a few things. Like rake those leaves." "I like the way they spread out under the maples." "Like it the way it is. My Allen tried that line on me a few times. Said he liked the ivy crawling up the house. Said he liked the den without a carpet. I never let him get away with it. We gotta set an example for these kids today. I—"
With a clunk of metal on rock, the Yazoo stopped. Cranston dashed away. Wendell looked down at his dog. "Come on, Patti. Cranston's not going to let us get away with it." He headed for the garage as his neighbor's voice rose again: "What were you, daydreaming? You break that blade, you're paying for it yourself!" Wendell dragged the hose around front. He sent a fan of water over the flowerbeds. The teddy-bear eyes of dandelions watched the sun. Their white balls of gossamer awaited the winds. Cranston hated dandelions like he hated crab grass and web worms. He once offered to come over (that is, send his son) and spray such offending life-forms with various grades of toxic waste. Wendell studied the yellow flowers and serrated leaves dotting his lawn. "Poor little things. You look thirsty." He sprayed water over them, a rainbow dancing on the flying drops. Through the rainbow he noted a strange lump near the street. A turtle? A run-down 'possum? Wendell walked idly toward the object. The cold stream from his brass nozzle became a dribble as a loop of hose folded. The old man whipped the hose around, and the water spewed again. He turned back to the road. The lump was gone. A panic of blue feathers burst from the juniper tree on Wendell's right. The jays twittered angrily as something shook the dark green foliage. He knelt beside the juniper. Through a haze of shadow and light he glimpsed legs scrabbling over dry leaves. He rose again. Hard by the juniper stood the hedge. In Cranston's yard you could see the black roots and stems that supported the green wall. Not so here, where the wind packratted leaves, candy wrappers, and newspaper fliers. An oily splotch of mulch showed where something had forced its way under the hedge. Probably a rabbit. The old man wheeled out his Toro, contemplating the hours of mowing that faced him. A clatter like a rock slide came from Cranston's yard. Wendell guided his mower to the fence. Allen, armed with crowbar and pickaxe, methodically tore bricks loose from a raised azalea bed. "What are you up to, Allen?" called Wendell. "Dad said to knock down the walls around the flowerbeds," answered the teen. "He wants to build new ones." "What was wrong with the old ones?" Allen shrugged and wiped his forehead, leaving a streak of dirt behind. "You do a lot of work around there," Wendell observed. The younger Cranston, attired in sweaty T-shirt and shorts, stacked bricks in a lawn cart. "Dad would help more if he could, but you know — his heart." Wendell had heard of the elder Cranston's heart condition. It never impeded his intake of pizza, beer, coffee, and donuts. Nor did it affect his voice. A shout rose from the Cranston house: "Hey! Allen! Hurry up with those bricks! We've got more work to do while it's still light!" "I've got to go," said Allen. The Toro's motorcycle sound filled Wendell's ears. Patti yapped, barely audible over the mower. Wendell made his about-face at the hedge and spotted the dog in the uncut grass by the shed. She lowered her head to the ground, hips high, and barked. She seemed intent on a brown lump, like a turtle, on the lawn. Wendell about-faced again. Patti, hyperkinetic a second before, lay still. The old man throttled down. Wendell jogged across the lawn. The cocker spaniel lay with her head and spine bent back in an incredible semicircle, her eyes like golf balls, her tongue green and swollen like a pickle. "Sorry to hear about your dog, Mr. Henderson," said Allen. He sat on the bench by the big oak tree, staring at the ground between his loafers. He straightened to find the Cranston boy at the back fence, garden hoe in hand. "Sorry about Patti," said Allen. "What happened to her?" "The vet said it might have been a coral snake," answered the old man. "You'd better be careful," said his neighbor. "It might still be around." "You really liked her, didn't you?" "She's shared the house with me since Gladys died." "Your father was right. If I mowed that howling wilderness more often, that snake — or whatever it was — wouldn't find the place so attractive." "Dad was right? There's something new." Allen looked toward the Cranston driveway. The older Cranston's Chevy Blazer was gone. "Well," said Allen, leaning against the fence, "let me tell you: Dad bought this house for the pecan trees. He was gonna sell pecans. But every year the worms got the pecans. So he sprayed them, and we all got sick. So he insisted on keeping the trees for shade, at least — but he couldn't understand why grass wasn't growing under them." "Grass won't grow under trees planted that close together." "Try telling him that. I spread fescue seed and fertilizer for years." Allen thrust a thumb over his shoulder. "You've never been inside, have you? You should see Dad's home improvements. He decided to wire up new light fixtures himself because he was too cheap to call an electrician. We broke our backs on that, and he still had to call an electrician. Then we put vinyl tiles on the kitchen floor. Now that was a horror story. And— oops!" Allen hopped over to the tomato patch as the elder Cranston's Blazer rolled into view. Wendell lay in bed, staring at the ceiling. Poor little Patti. Gladys brought the pup home one day, hidden under her coat as if Wendell might drown it in the creek. But he loved Patti as much as she did, and the peach-and-white dog became their spoiled surrogate baby. The old man sat up at the sound of a thump — followed by several softer "flump"s. Patti had made those sounds a million times over the years, the "thump" as she hit the home-made pet door in the garage, and the "flump"s as the door panel swung after her passage. But there was no Patti now. Wendell threw off the covers, slipped on his house shoes and padded down the hall. He grabbed the broom by the refrigerator, flicked on the garage light, and opened the door. His Buick took up the middle of the two-and-a-half car garage. The door to the back yard stood on the right, the lowest panel replaced by the pet entrance. On the left, chairs, steamer trunks, Christmas decorations, and golf clubs formed a labyrinth to puzzle future archeologists. A lamp toppled from the junk pile and shattered on the concrete floor. The widower hefted his broom like a rifle and walked the length of the car, scanning the shadows. Something rattled over an old cookie sheet and into a little cave formed by a TV and a bookcase. Wendell knelt by the uninviting void, wincing at the pain in his joints, and poked the stick end of the broom in. A sharp blow jarred his hands as if someone hit the handle with a mallet, then the broom jerked side to side. Wendell dropped it and jumped away. The handle banged against the bookcase and television as loud as a pack of Black Cats going off. Crashes from the garage, then another thump against the pet door as — whatever — left. Half an hour ticked by before Wendell could force himself back out. The broom lay by the car, its handle a mass of splinters. Wendell stacked cinder blocks and his old tool chest in front of the pet door. Wendell did not sleep well. Something skittered across the roof. A squirrel, he told himself. Something climbed the fence with that squinking noise peculiar to chain link. A cat. Something raked the window screen above his bed. A branch. The next morning he explored the back yard, checking gingerly behind the charcoal broiler and the rose bushes. Once he looked up. Mr. and Mrs. Cranston stood by their Chevy Blazer, looking back. He waved, feeling like an idiot. The Cranstons climbed into the vehicle. Mrs. Cranston was a bit of an enigma; Wendell had lived here eight years, but he had never said more than a hundred words to her. She usually bore that much-put-upon expression Alice Cramden wore on the old Honeymooners show. The adult Cramdens — Cranstons — drove off. Their son appeared, his scowl visible from Wendell's patio. Wendell traipsed over to the fence, watching for turtle-like lumps. Allen put on a smile. "Allen — have you seen anything unusual lately? An odd sort of animal?" "I'd like to know what's been digging under the fences, though," the teen said. "Dad's on the warpath." The boy raised a hoe. "I get to fill in the holes it's dug. Then I can get the old, crud-caked pots and replant the begonias. And the gutters need cleaning again. Hoo-boy!" "You seem less satisfied with your lot in life this week, Allen," observed Wendell. The youth leaned on the hoe handle. "Yeah, well. I've sort of been seeing Deborah Hanauer." Wendell raised his eyebrows. "And?" Allen spat at a pile of dirt by the fence. "He doesn't want me to see her. Says she's from a sleazy family." "The Hanauers? They've got a relative in jail for running a meth lab, but..."
"That's not it. He doesn't like her just because I do. It's always been that way. When I set up the birdbath and those stupid gnomes, he uprooted them all and carted them across the yard. Just because I picked that spot. When I say we ought to go to the lake, he drags us to the mountains. If I say the mountains, he drags us to the lake. If he says the mountains and five minutes later I say the mountains, he'll drag us to the lake!" The youth pulled a brochure from his hip pocket and handed it over the fence. "The University of Missouri at Columbia," said Allen. "That's where I'm going next year. I've already been accepted." Wendell opened the brochure. It had been folded and unfolded many times. "That's where Debbie's going," Allen continued. "And it's just a little too far for me to return on weekends and plow the south forty. I'll get a job there — hell, I can't think of a job worse than working here all my life!" "Well, good luck, Allen," he said. "Thanks," said the youth. "Now if I could just catch whatever's doing this." He kicked dirt into a hole under the fence. Wendell opened the work shed door. Nothing dangled from the rafters or hunkered in the corners. The hedge — the junk in the garage — the plastic trash bags full to bursting — the old camper trailer, nearly buried in thistles — the Henderson place was full of hidey-holes for things small but unpleasant. Wendell pulled the Toro into the light of day. Patti's death had put a temporary halt to mowing. He remembered the dog and the — whatever — in the high grass. He lowered the cutting level of the blade. "You won't hide there anymore," he muttered. He reached the trailer. Grass and weeds grew riotously around it. He hadn't touched it since he and Gladys went to Lake Eufaula, three years before she died. He pushed the mower under the trailer as far as it would go. The roar of the engine dropped in pitch as the blades chopped into the thick greenery. He'd clog it for sure this way. He pulled the mower back and pushed down the handle to raise the front wheels. He worked the machine a foot or two over and lowered it slowly, grinding weeds down. Allen lay flat on the Cranston roof, digging wet pulp from the rain gutter with his bare hands. The boy waved, black leaves like leeches on his arm. Wendell lifted the front end of the mower and dropped it onto high grass again. A metallic screech filled the air. The engine sputtered and died. The screech continued. The front wheels of the Toro bounced into the air. Wendell gasped and stepped back. The rear of the mower, handle and all, jumped up to reveal a brown lump. The ungodly screech continued. The lawnmower bucked like a horse. Allen yelled something from the roof. The mower fell over. For the first time, Wendell saw his adversary clearly. The brown lump was the body, but legs or feelers or something surrounded it. The thing spun like a surprised cockroach, limbs blurring so fast he could not count them. It disappeared under the trailer. The teenager jogged across the Cranston roof. He grabbed the aluminum ladder at the corner of the house and swung a foot onto a rung. Wendell backed away. The thing stopped screeching. He heard a crash. He looked to the Cranston house again. The ladder — and Allen — lay on the patio. A dozen televisions hung from the ceiling of the waiting room. ESPN, CNN, HBO, E! talked over and under one another. Wendell studied the people waiting with him. Men, women, a little girl sleeping on a couch, a wrinkled grandmother flipping through Newsweek. "Well, he's going to be here a day or two," said Allen's father. "Broke his arm, and he's got a mild concussion." Cranston sat on the vinyl seat next to Wendell. "Concussion! He could talk well enough when I saw him. Said you'd been — attacked by something. What was that about?" "I, er, ran over a 'possum," said Wendell. "It made such a racket, I must have yelled out." "Allen fell off the roof for that? I'm surprised he hasn't broken something before. Missing the ladder! Imagine!" He snorted. "But he never was too good at handling things. Nails things crooked, leaves globs of paint behind . . ."
Cranston leaned back, shaking his head sadly. "Not much of a decision-maker, either. He's got some half-assed idea of going to the University of Missouri. Thinks he's going to live off me, hundreds of miles from home. Hell, OU was good enough for me, and it wasn't four hundred damn miles away. And if he'd gone for that football scholarship like I told him..."
"But shouldn't Allen have a say in what college he attends?" "He can go anywhere he wants," said Cranston. "But I'm not paying for the University of Missouri." Wendell dragged his mower to the middle of the yard, where the grass was golf-course short. He tilted it onto one side and inspected the fibrous mulch caked to the undercarriage. The normally green mass was stained yellow. 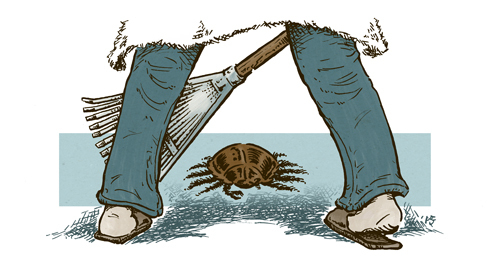 Wendell crept back to the trailer, rake in hand. He noted more yellow stains, like mustard, on the ground. Then he found a big brown centipede. The old man hooked the creature with the rake's iron teeth and lifted it. It's not a centipede. It's a leg. He entered the house, rake and all, and snatched up the morning paper. He whipped it open across the kitchen table and let the leg plop onto page one. The mower had sliced it neatly from the brown thing. Each segment of the limb could slide partly into the one before, like a spyglass. What would have been legs on a centipede were spines or hairs along the sides. At one end hung a nasty crab-like pincer. He lifted the thing with thumb and forefinger, screwing his face in disgust. He thought of starfish, squids, and Daddy Longlegs, but this tentacle did not belong to anything he'd ever heard of. All he knew for certain was that its owner was dangerous. Eventually the Blazer pulled into the Cranston driveway. Cranston climbed out alone. Presumably his wife stayed at the hospital. Wendell turned on the Public TV station and watched an old Lawrence Welk Show. If only the brown thing wasn't so flat! The way it could hide in tall grass or slip under the trailer... What he needed was a sawed-off shotgun, but he didn't own any firearms. The zoo? The police? What would he say? The vet thought Patti had been bitten by a snake. That seemed to be the best bet. Animal control people would have to look in every nook and cranny. A slow-moving documentary about the Great Barrier Reef followed Lawrence Welk. Wendell's eyelids drooped. Something somewhere scratched like Brillo on a cheese grater. Something else — maybe the green vase by the garret window — crashed to the floor. Wendell struggled out of his recliner and edged toward the kitchen. The planks of the second floor transmitted a dull scrabbling sound. The old man backed onto something that gave beneath his foot like a gas pedal. What? The handle of the rake hit his shoulder. Like a doofus in a comic strip, he'd stepped on it. Something plopped from the stairs onto the living room floor. Wendell snatched up the rake. The brown thing crept into view. The old man gasped. Somehow he could accept it, half-seen in shadow or under the hedge, but in his house, in the glare of his seventy-five watt bulbs — things like that just did not exist. The central body, wide as a basketball, balanced on a dozen segmented legs that whirred along at an amazing speed. Wendell thought of the rotating brushes of a street cleaner. The creature looked like something Wendell had just seen in that boring documentary — a brittle star. That sea-dweller, however, dragged itself languidly across the ocean floor. The brown thing sprang like some impossible squirrel. Wendell swung the rake, hitting the creature in mid-flight. It fell back with a wet spaghetti slap. The brown thing flipped right side up like a click beetle. It scrambled for Wendell's ankles. He shoved the rake along the floor, shuffleboard fashion, knocking the creature away. It drew in its legs and rolled. The old man took a few steps toward the garage before the thing scampered at him again. He thrust at it, but this time the creature wrapped several legs around the rake's iron head. Pincers snapped at the wooden handle. Pale slivers flew from the shaft. The old man shuffleboard-shoved the rake again but let go this time. He ran for the garage door. The multi-limbed thing clicked over the kitchen tiles even as he turned the knob. Damn, it was fast! He jumped through and yanked the door after. Wendell caught the thing between door and jamb. He pulled with all his might. A spike of white pine split from the door. The thing forced itself through slowly, inexorably, its spines like gear teeth. The old man groped along the wall, where tools hung on pegs. He seized a wooden handle just as the brown thing pulled free. Wendell swung his new weapon at the creature. The old handsaw slapped across the many-legged attacker with a ridiculous rubbery sound. He tried batting it away. The creature dug its pincers into a crack in the floor, refusing even to skid. "Hold still, then!" yelled Wendell. He brought the saw blade down like a sword, then he set his shoe on the creature and drew back hard. Yellow blood splattered. The monstrosity screeched. (Where was its mouth?) It scampered across the garage, pulled its limbs back like a girl's hair in a ponytail, and hit the pet-door with a resounding smack. Wendell trotted after, wheezing. The yard was dark, but he heard a steel mesh rattle at the back fence. The brown thing rolled up the chain link rather than climbed and dropped into Cranston's yard. A light burned in Cranston's garage. A strident noise indicated that Cranston worked with a circular saw. Flailing legs eclipsed the light. The creature made straight for his neighbor's open garage door. Cranston couldn't hear over the whining saw. Wendell reached the fence and tried to lift himself over, but he had not climbed fences in half a century. He nearly punctured his abdomen on the sharp prongs on top. He puffed back across the lawn. He would have to drive around the block to reach Cranston's house. A curving drive led right up to the front step of the Cranston house. Wendell barely switched off his ignition before jumping out. He opened his neighbor's door without awaiting an answer. With the wife and son at the hospital, the place was empty. The old man worked his way toward the garage. He found the fireplace and grabbed a poker. A door in the living room led to the garage. It was not quite shut. A bar of light shone through, and Wendell heard a few strains of country music. The saw's whine had ceased. Wendell peeked out. Nervous as he was, he had to whistle. The Cranston garage looked like a Sears outlet. Weed-whackers, edgers, leaf-blowers, and other machines stood like soldiers in neat rows. He stepped out carefully. Near the yard door a pair of sawhorses stood in heaps of beige snow. A Black & Decker circular saw lay on the concrete floor. Cranston lay face down halfway out the door. The thing seemed to have come and gone. Wendell crept across the garage and knelt by his neighbor. He set the poker down to turn Cranston over. Cranston's face had puffed up like a balloon, his tongue a grotesque cucumber. Wendell shook his head slowly. From the yard came a screech like metal tearing. The chitinous monster scuttled in right over Cranston's body. Startled, Wendell fell on his rump, then his back. He waved his arms wildly as if making a snow angel. His fingers closed on something cold and hard: the handle of Cranston's circular saw. He pulled back the safety shield just as the creature jumped. It draped itself over the power tool and Wendell's hands. A jet of yellow liquid shot from the spinning blade. The creature sprang away again as if yanked by a rope. Wendell rolled over and lurched to his feet. The brown thing's claws tacked against the floor like a rain of buckshot. The old man ran for Cranston's Black & Decker/ Craftsman/ John Deere collection. Spiny arms lassoed his ankles. He fell but kicked like a jackass on crack. The creature lost its grip. It's weakening! God, let it be weakening! He dragged himself up with the help of an orange metal box with a funnel on top. A leaf-mulcher? A woodchipper? The thing had turned turtle again. Only now did it flip itself up. It was weakening — slowing, at least. Wendell pushed the mulcher's throttle to CHOKE. He found the starting rope and yanked with both hands, nearly hauling the machine off the floor. The engine putted and died. The brown thing froze for a second at the brief motor sound. Gaining some respect for our noisy machines, I see, thought the old man as he yanked the cord again. Maybe you'll find some for their creators. The mulcher roared easily to life. Well, Cranston probably polished every cam and washer. The multi-legged creature actually cringed. Wendell took the opportunity to check the wall behind him. Hanging here were folding chairs, fishing rods, a hunting bow, a quiver of arrows. Wendell worked an arrow out. It looked like a damned harpoon, its head a steel barb with four razor-edged fins. Cranston never did anything halfway. The creature scuttled forward. Wendell gripped the arrow in both hands and plunged at the thing like Captain Ahab. The arrowhead, sharp as it was, could not penetrate the central body, but the brown thing clamped onto the fiberglass shaft. "That's it," hissed Wendell. "Hold tight!" He heaved the arrow and its passenger over the funnel of the mulcher. The creature spread its limbs like the petals of a flower. "Oh, no you don't," said Wendell. He shoved the arrow like a plunger. Pincer-legs scrabbled against the steel funnel. The creature vanished into the guts of the machine. The engine coughed but did not die. Bits of brown shell and yellow flesh spilled out of the exit chute. Wendell waited a full minute. Nothing more flew out of the mulcher. He finally pulled the throttle to STOP. He sat down heavily among the gardening machines. He supposed he should call the police. He could say he heard Cranston scream and found him like that. Let the cops explain the yellow-brown creature mush. Finally Wendell rose and staggered to the kitchen door. He looked past Cranston's inert form out into the yard. He had assumed the brown thing was unique, a mutant, a freak of nature. But what if there were others like it? What if it was a scout? A harbinger of some sort of — invasion? From whatever green-lawned Valhalla he now inhabited, Cranston snorted in amusement. Michael D. Winkle was born in Tulsa, Oklahoma, and has lived in the same general area ever since. He received a B.A. in English from Oklahoma State University and is now working on an Associate's in Accounting. He has worked in institutions such as the University Center at Tulsa and Tulsa Community College. He has had over two dozen shorts stories and articles published, including "Wolfhead" (Tales of the Witch World 3, edited by Andre Norton) and "The Curious Adventure of the Jersey Devil" (Panverse 3, edited by Dario Ciriello). He has also written several novels which slowly creep toward publication.